Bringing a new baby is one of the most exciting things that can ever happen in person’s life. Along with the tears of joy, comes the anxiety and sleepless nights. Babies need to be changed and fed every few hours, and new parents lose a lot of sleep. But for many parents, it’s not just the multiple middle of the night feedings and the piles of wet diapers or even the feeling of trepidation that new parents feel when their baby isn’t crying. Some babies suffer from colic. 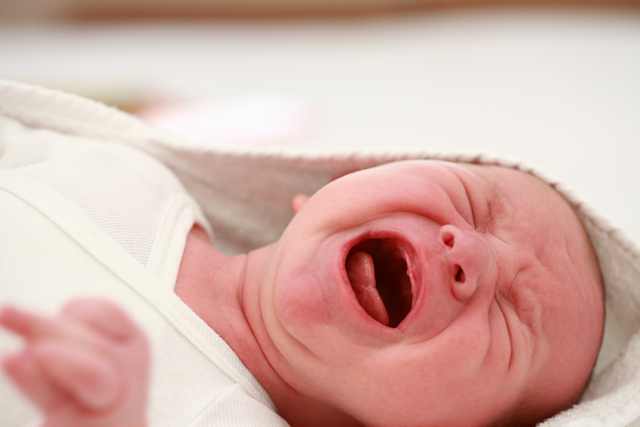 What is colic in an infant? That appears to be the burning question every new parent with a colicky baby wants an answer to. There are many differing opinions. Could colic be caused by gas, stomach pain, overstimulation, a still-developing digestive system, exposure to tobacco smoke exposure or could it just be a baby who cries more than others? These, of course, are just theories. Without an obvious reason for why your baby has colic, it can be hard for a parent to determine how to treat it. You can do everything right for your infant. You keep him on a feeding schedule. You take the time to burp them after he eats to help prevent uncomfortable gas pains. You love him with every fiber of your being. There isn’t anything you wouldn’t do for him. Yet, he still cries for no apparent reason. No amount of cuddling, rocking, driving around the block can soothe him. You have tried everything that your mother, her mother and your pediatrician have suggested. You’ve created a calm environment. You have tried gas drops and applied pressure to baby’s belly after they eat. If you breastfeed, you’ve changed your diet. If you bottle feed, you have changed his formula. You have introduced probiotics. You have tried soothing him with music and holding him close. Unfortunately, not one of these things, and not any combination of them have worked. The inability to comfort your infant and stop his pain or discontent makes you feel ineffective as a parent and frantic to find something that helps. The crying and your inability to give your baby relief are heartbreaking to you. What to do in your desperation to find a Colicky Baby Treatment that works? Take him to the chiropractor. That’s right; Cure Your Colicky Baby Naturally with Chiropractic Care. Just as a woman’s body goes through trauma when giving birth, a baby’s body is also subjected to trauma, particularly in a delivery with prolonged pushing, or if the delivery is assisted by forceps. These assisted deliveries can cause misalignments in the baby’s back and neck vertebrae. Sometimes, these misalignments can cause digestive system issues that may be causing your child’s colic. While there are many misconceptions about chiropractic care that may frighten a parent, the right chiropractor may be the answer to your baby’s issues with colic. You may not realize it, but chiropractors treat infants for many different conditions. With just a gentle touch of the fingers, a baby’s misalignments can be adjusted, easing their tension and the other symptoms of colic. When everything else has been tried, you have nothing to lose, and everything to gain with chiropractic Colicky Baby Treatment. Spine Plus Chiropractor wants to give you and your baby relief from your colic woes.